Clearing a place for what is now Edinboro was a massive undertaking. Clearing a plate at Edinboro's Flip Cafe may also require a mammoth effort, but it's far less likely to break your back and very likely to bring you back. Prior to the 19th century, Edinboro was known as Conneauttee, or "Valley of the Living Snowflake" among the Native American tribes that inhabited the region, including the Eriez, Iroquois, and Cornplanter. While the natives surely meant "snowflake" in a more ethereal context, the area was liberally wooded and fairly inaccessible, so navigating it did demand a certain sensitivity. In short, just the sort of thing you'd address with an axe — and after that, shovels and ploughs. The venturesome William Culbertson got the party started in 1801 when he built a gristmill near the outlet of Conneauttee (Edinboro) Lake — and all that flour would be needed, too, because it turns out building a community from scratch takes a lot of energy. Accounts from 1800s logging camps reveal that these people packed it in, sometimes to the tune of 4,000 to 6,000 calories a day, according to the estimate of blogger and historian Rob Burg. Documenters of the shantyboy (i.e. lumberjack) experience in Northern Michigan describe sumptuous feasts of sourdough pancakes, biscuits, fried pork and potatoes, donuts, oatmeal, beans, prunes, all washed down with strong tea or coffee (pie or sweet rolls would make an appearance if they were lucky). A good cook was considered a key cog of a logging operation — after all, no one wanted to be accused of "belly robbing" (i.e., depriving workers of the nutritional wherewithal for their hard labor). It's doubtful anyone would level such a grievous charge upon Flip Cafe founder Julie Becker and her cadre of creative cooks, because they dish it out to delicious effect. Although these days calories typically aren't being funneled into clearing acres of timber or planting acres of crops, that doesn't mean breakfast still isn't the most important meal of the day. It's all about potential, both of the fare itself and your theoretical productivity thereafter (because food comas are a thing). "Breakfast is my favorite. It's easy, fast, and you can be super creative," says Becker, a graduate of the Pennsylvania School of Culinary Arts and a veteran of the restaurant business for over 30 years. Becker set up shop at 103 Meadville St. along Edinboro's main thoroughfare in September 2011, serving up breakfast and lunch and offering a hipper alternative to the nearby Perkins franchise location, which pre-'90s kids (especially students of the university) will remember as the place to curb a hangover. The dining area occupies what was originally a bank — and subsequently a Mexican restaurant (Jack Rabbit Flats), vegetarian restaurant (The Singing Bowl), and hairdresser (in no particular order) — and is bright, cozy, and eclectic. Or shall we say … eclucktic? The back room pays a colorful homage to the chicken, issuer of wake-up calls and purveyor of breakfast's most irreplaceable protein. Here, the egg comes first. If you favor a savory breakfast, omlettin' you know that Flip is absolutely everything it's cracked up to be. Omelets are — as at most establishments —fully customizable, but if you're not inspired, that's more than okay, because the chef specialties are all great ideas that may have never occurred to you otherwise. There are Tex Mex selections (a jalapeño omelet with guacamole, cheddar jack, ranchero sauce, and salsa; one with chorizo, salsa, and sour cream), Mediterranean creations (you can get the ingredients of a gyro or a Caprese salad enfolded into your eggs! ), and a few surer bets for the meat sweats (the Reuben, pulled pork, and beef tenderloin varieties), in the best possible sense. I would be remiss if I did not also mention the SMASHes, something like godly breakfast casseroles where eggs, meat, cheese, potatoes, and various fixings converge like PA 99 and US 6N. If the sweetness will be concerned with you, you're in for a treat. Actually, several. A cooler full of homemade cookies, cakes and pies tantalizes the eyes the moment you step through the door. If that doesn't seduce you, or you'd rather be a little more discreet about eating dessert for breakfast, you might begin with swapping out toast for Flips with your meal. It's a sneaky move perpetrated by roughly half of Becker's customers, who have been steadily gobbling up the cinnamon-sugar dredged morsels of fried dough since their introduction. Wait, that sounds awfully familiar, doesn't it? How is a Flip different than a donut hole, exactly? "I don't know that it is," admits Becker with a laugh. "But it's kind of nice to have that option." And there are no shortage of those throughout the menu, starting with the pancakes, which can be made with buttermilk, whole wheat, or (in true pioneer fashion) cornmeal batters and stuffed with an assortment of fillings for a small upcharge. French Toast fanatics will find not only the standard white bread variety, but bakery items (e.g., cinnamon rolls, peanut butter rolls, Red Velvet cake roll) sliced up and given the same treatment, adding another layer of decadence. And that's just the standard menu; on any given day the specials board will have something new to salivate over that just might eventually become a fan favorite. The cream puff and Calling Elvis (peanut butter-banana) pancakes, bacon French toast, the SMASHes, and even the eponymous Flips began as well-founded experiments. "We're a pretty tight-knit group. There are six of us [cooks]. Everybody has their own thing, their different backgrounds, their likes and dislikes. We put whatever we like up there. It makes it a lot more interesting for us and our customers," explains Becker. For example, Becker's bailiwick is breakfast, but there are a couple of guys in the kitchen that really love to do lunch (served from 11 a.m. to close) — and good thing, too, because during the week it makes up a larger percentage of the business, especially since delivery service was added six months ago. Flip offers a veritable smörgåsbord of scratch-made soups and sandwiches, along with hearty homestyle favorites like beef stroganoff, Mac n' cheese, and pierogies. Edinboro may seem like a hike for many folks, but take a moment to gawk at Flip's Instagram page and you might just feel a strong migratory impulse. In the former Valley of the Living Snowflake, be prepared to melt for Flip. 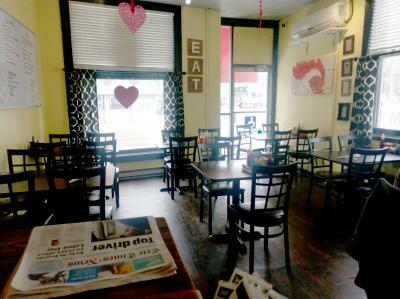 Since it's well after 1852, Flip Cafe is accessible via paved (not plank) road at 103 Meadville St., Edinboro, PA 16412 and open daily from 6:30 a.m. to 3 p.m., and was one of the three finalists for Best Breakfast in the 2018 Best of Erie awards.